Most living spaces use textiles as membranes and interfaces. When we sleep at night we inhabit an almost entirely textile place. 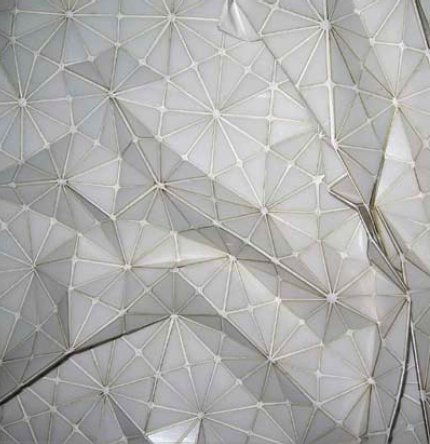 We imagine extending familiar textile aplications into the built environment to create fully integrated textile architecture inspired by biological systems. One of the domestic textiles we have been focusing on is a window covering. Making such a design responsive alow it to grow, metabolise and synthesise with qualities in its immediate surroundings. It can be light emitting, temperature regulating, structural and adaptive. Looking at plants spinning, weaving and knotting themselves around features in their environment, we cannot but think how they inspired humans to manipulate fiber and thread. It is the nature of many plants to climb and attach themselves tangentially to establish a structurally stable and energetically efficient link. 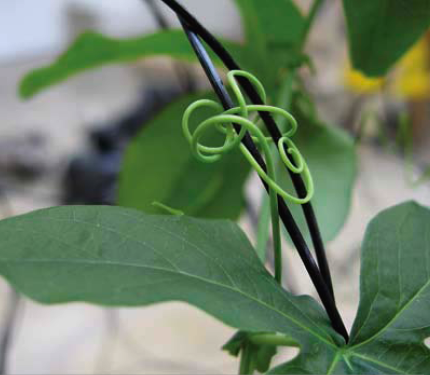 In the image below, can be seen a knotted end of a tentacle that a passion flower uses to anchor in space. The two black rods are a fiber composite and part of a woven space-frame we are developing for plants to grow into and consume. The space-frame uses tangential joints exclusively and could easily be scaled to fit many life-form’s requirements. A woven textile is an example where many individual fibres, weak when singular, provide great strengh in unison as they interlink and cross one another. The language of textiles is often used to describe systems in our world that overlap and work together to create a harmony. The construction of fabrics can be described as a parallel for co-existence and inter-dependence in a sociological context. An urban fabric is interwoven with people, neighborhoods, homes, work places and institutions an a community is strengthened when diversity is present.